While the sharing speed of the internet and social media has made the accessibility to the Paris haute couture shows universal, what is doesn’t show is the intricate artistry of the craftspeople behind these distinguished fashion houses. It is their tremendous talent that translates the designers’ visions into runway reality. And it is this combination of the designers’ creativity coupled with the meticulous expertise of these artisans that elevates fashion to an art form. 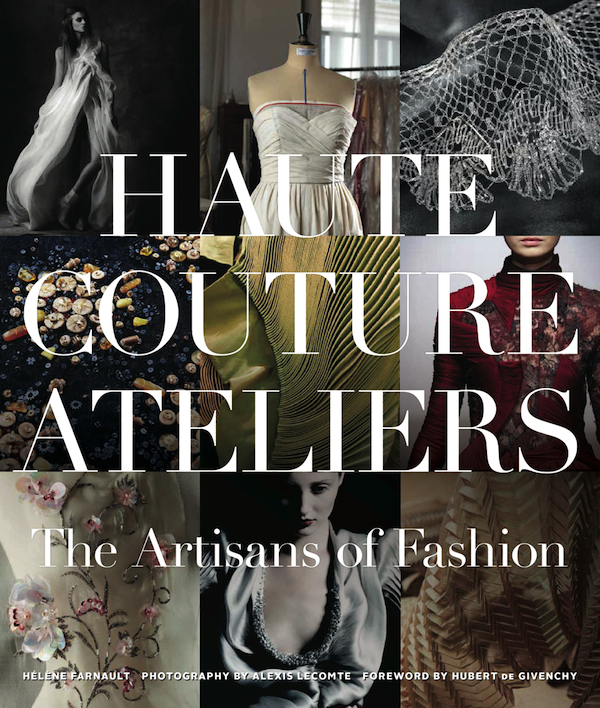 And now, in the beautiful new book Haute Couture Ateliers | The Artisans of Fashion, you can go behind the scenes to tour the process of transforming designer dreams into exquisite finished creations. Many of these ateliers have existed for a century or more and while their numbers have dwindled, their contributions to the world of fashion have not. And that is why Chanel has, since 1997, quietly acquired a handful of these prestigious workshops, under the Paraffection umbrella, to preserve the Old World techniques and skills so essential to haute couture. In the book, you will meet both designers and experts in embroidery, lace, weaving, textiles, pleating, feathers, passementerie, leather, fans, couture costume jewelry and more whose contributions help preserve an artistic heritage, and whose tradition is so linked to history and culture. Designer Stéphane Rolland creates sculptural works of art, using these ateliers of decorative arts to provide the drama for his haute couture creations. Above, from his Summer 2013 collection, a long bustier dress in dipped lambskin and cloud grey chiffon features a glass petal plastron. I love how the bodice lends an architectural structure to the feminine fluidity of the skirt. Wedding dress and lingerie designer Fanny Liautard began her career as an assistant making clothes for Hubert de Givenchy. After positions as a designer for other top fashion houses, she opened her atelier near the Place de la Concorde, working with many artisans to finalize custom creations for her private clients. 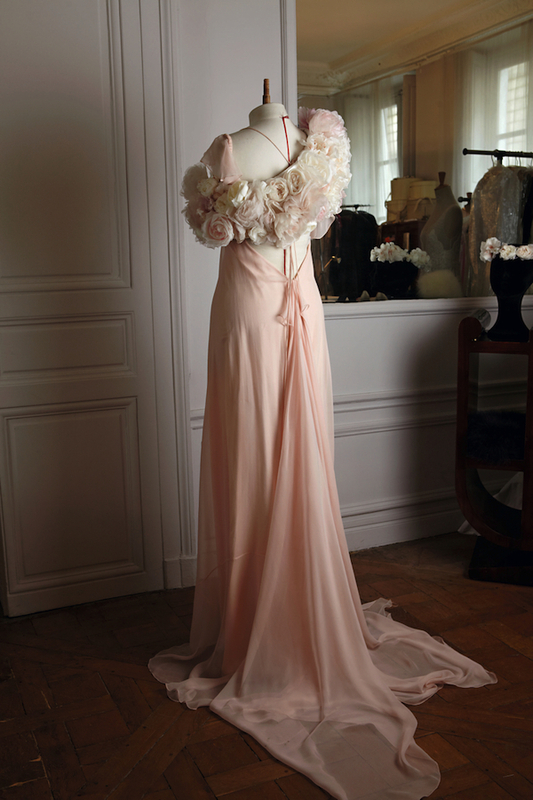 Above, an amazing circular stole of handmade silk organza flowers tops a powder pink backless chiffon dress. 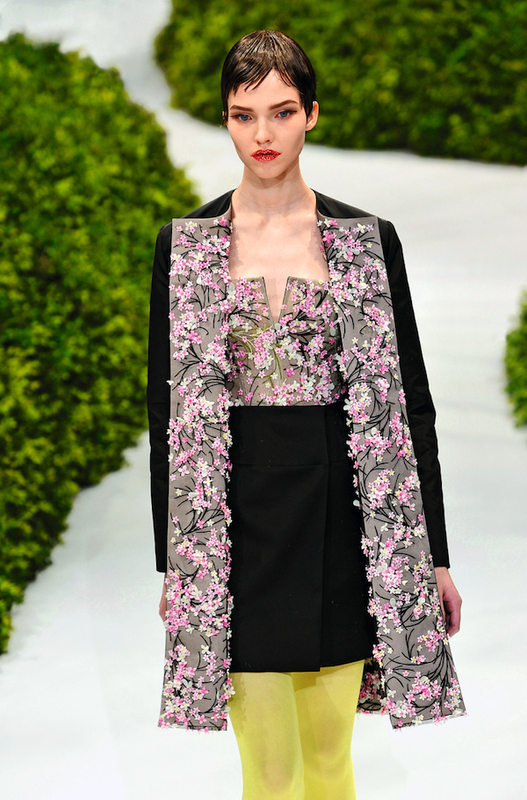 Like Christian Dior himself, Raf Simons is a master of his craft. 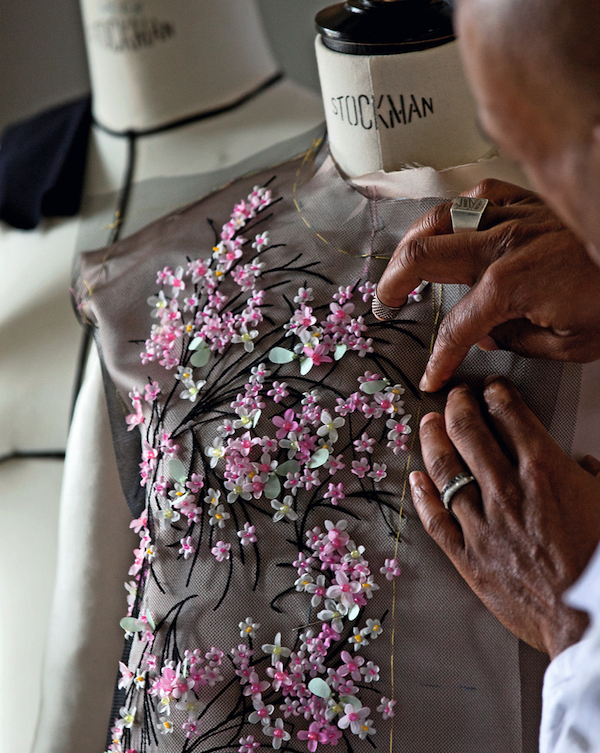 He has revitalized and redefined the Dior label with his modern interpretation of the house’s distinguished history, including his dynamic use of custom hand embroidery. Above, the sewing of fabric flowers with bead centers on tulle with black chain stitch seams. And below, the spectacular finished bustier and coat for the Haute Couture Spring-Summer 2012 collection. The embroidery firm of Lanel, founded in 1949, is now headed by artistic director Bernard Perris, who supplies top houses including Chanel, Dior and Valentino. 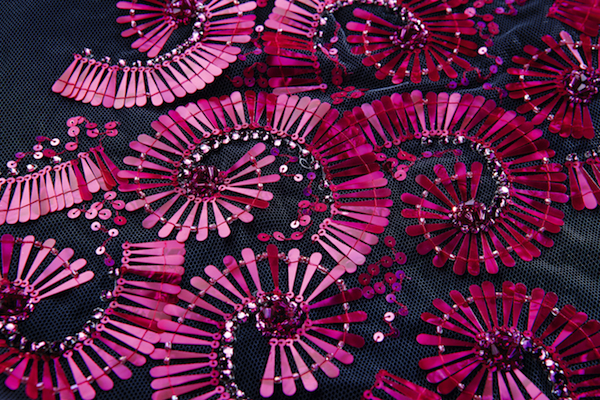 With an enormous archive, they create a wide variety of patterns such as this colorful creation of fuchsia Rhodoid scrolls set with glass stones and sequins to appear on white tulle. Broderies Vermont was founded in 1956 and modernized the industry with new techniques such as the chenille effects used by Chanel to edge her tweed suits. 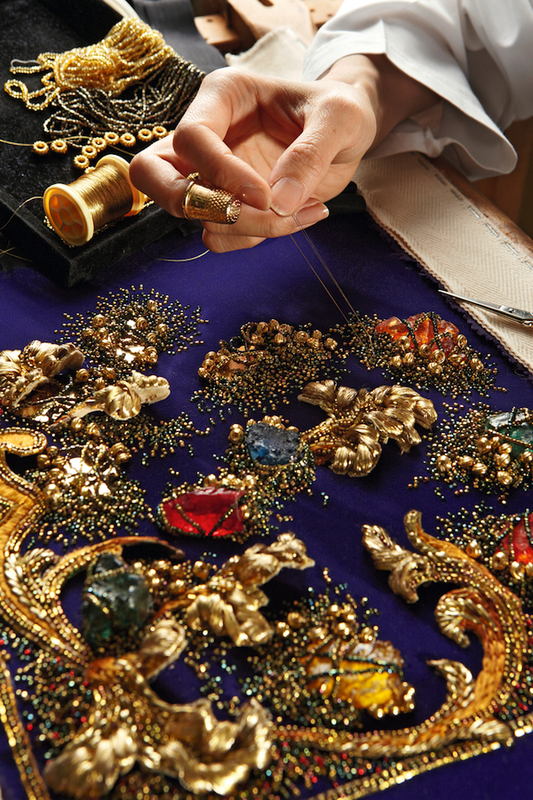 Below, a sample of their baroque-style embroidery with acanthus leaves embroiderered in relief in gold thread and colored resin stones on clusters of old gold and bronze beads. Like embroidery, lace has been an integral part of fashion for centuries. The rare craft of Leavers lace is produced by the firm of Sophie Hallette in northern France. This complicated and time intensive textile can provide a wide range of product limited only by the designer’s imagination. This fascinating chapter shows the many steps involved resulting in creations such as Oscar Carvallo’s amazing gown below, from his winter 2013 collection, of Sophie Hallette lace, embroidered with copper beads, tulle flounces and appliqué leather peacock feathers on the bodice. Feathers have played an important part in fashion since pre-Columbian cultures. Often thought to be imbued with magical powers, they have symbolized health, prosperity and healing. Travel, and the discovery of new species of birds with prodigious plumage inspired works of art, fashion and tastemakers, including Marie Antoinette who incorporated them into her elaborate trend-setting coiffures. Featherwork has since been used widely in Parisian haute couture. In fact, the book shares that at the beginning of the 20th century, there were over 800 feather workshops in Paris, which has sadly dwindled down to four today including Nelly Saunier, who has worked with many of the top houses including Jean Paul Gaultier, Yves Saint Laurent, Givenchy, Nina Ricci and others. Below, one of her design notebooks shows a list of materials, colors and dye references, along with feather samples. Below is an extravagant wrap dress by Jean Paul Gaultier for the spring-summer 2005 collection with dyed ostrich feather trim that Nelly coordinated with the fabric. Artificial flowers used in haute couture can be fashioned from such materials as silk, organza, taffeta, velvet, lace, muslin, leather or Rhodoid. With romantic allusions and endless symbolism, these adornments “conjure memories of long-forgotten scents, a nostalgic reminder of their ephemeral nature.” The family of Bruno Legeron has been supplying artificial flowers to haute couture and luxury prêt-à-porter houses for over a century. Below, a cape dress by Stéphane Rolland in sand-colored muslin and jersey is embroidered with burnt ostrich feather flowers. 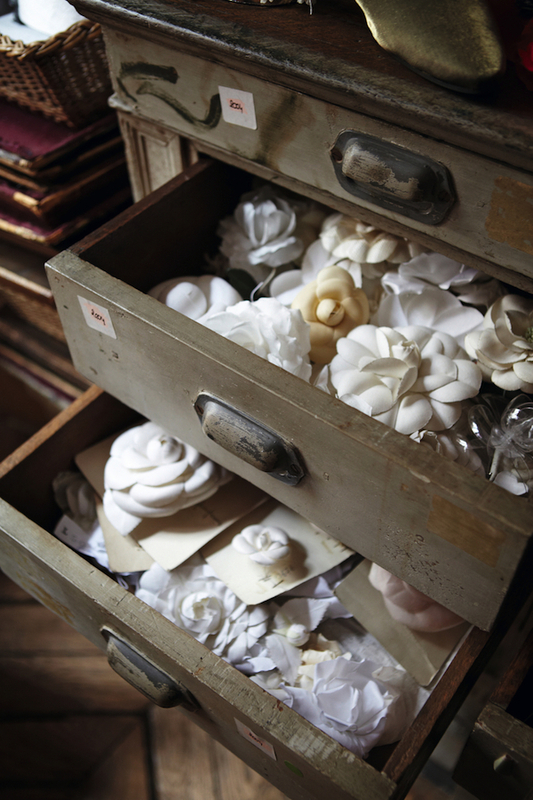 And below, a drawer of handmade camellias, assembled petal by petal. Each different style is recorded and kept in the archives. This entry posted in books, design, fashion. Entry Tags: Design Books, fashion, fashion ateliers, haute couture, haute couture ateliers, Paris Bookmark the permalink. A stunning book Stacey, I have it and will treasure it forever! What a treat to begin my morning with your post! 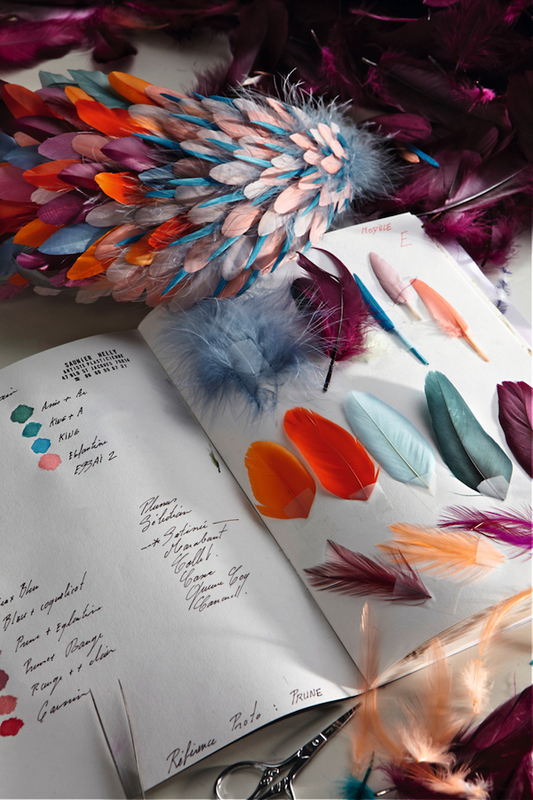 Nelly Saunier’s feather notebook is to die for! Ateliers -or workshops as we say here are invaluable. As a fashion design student in Paris, I remember losing myself in a tiny shop specializing in velvet ribbons and passementerie and just feeling I’d died and gone to heaven. The craftsmanship displayed by these specialists is a treasure one should hold to…Thanks, Stacey, for a refreshing post. I adore craftsmanship in fabrics, and this book is a definite must to add my collection. Thank you show much for the peak inside! Love your blog about haute couture !